When it rains,it pours.Sounds very true if you count the cookbooks I've garnered in the last few months or rather even,last week! !I remember salivating over every post of Tuesdays with Dorie,sighing all the while thinking when would I be able to lay my hands on this baking encyclopedia,as termed by almost all who owned this book.My dream came true during my birthday when Ajay gifted me this book.I was[still am] so fascinated by it that I am really scared when it comes to baking from the book fearing if I would live up to the expectations!! I have baked a few bakes already and am gearing up for more.The recipes are so simple and clearly explained that you just need to pull up your socks and bake!! I won Suma's Bake-o-mania giveaway-Rose Levy Beranbaum's famed cookbook-The Cake Bible.Even before I could go through it,came another book from the giveaway I won at Ann's-A Passion for Baking by Marcy Goldman.I am totally kicked and can't find any reason to buy 'another baking book'!!! Here's a simple Muffin-cake recipe from BFMHTY,which can be made in a jiffy and tastes like the perfect tea cake with the goodness of Apples and the crunch of nuts. Center a rack in the oven and preheat to 400 degrees F/200 degrees C. Use an 8-inch square pan, buttered and floured. [I used an 8 ½’ square pan]. In a large bowl, whisk together flour, sugar, baking powder and soda, cinnamon, and salt to combine thoroughly. Toss in the brown sugar, making sure there aren't any lumps by running it through your fingers, then add the oats and whisk the dry ingredients a few more times to mix. Switch to a large rubber spatula and stir in the liquid ingredients, stirring just until everything is moistened--as with muffins, less mixing is better than more. 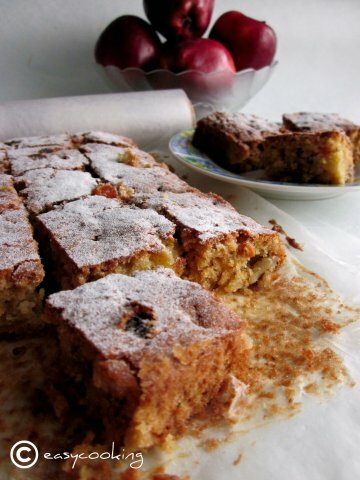 Gently stir in the apple, nuts and raisins, and scrape the batter into the prepared pan. Bake for 30 to 35 minutes, or until the cake is golden brown and a thin knife inserted into the center of the cake comes out clean. Transfer the pan to a rack and cool for a couple of minutes before running a knife around the sides of the pan and unmolding the cake; invert and cool until warm or to room temperature. *I was out of my mind and forgot overlooked the part which says,butter-melted and cooled.I used softened butter and I don't know if it made a change coz the cake was soft and melt in the mouth!! Sending this to Ally's event Delicious Desserts!! On another note,my blog got its first press mention on Economic Times[!! ].It would have gone unknown if Jayasree had not sent me the link,thanks Jayasree! !Here's the link which made my day -Article on Economic Times. Congrats ..I just read the article..
Oh ..did I tell u..Cake looks absolutely gorgeous and yummy! Congrats Divya!! The cake looks wonderful!! cake looks awesome and am sure the nuts would have given that crunchy taste as that of brownies..
That's a scrumptious looking cake. Won't the Appy create a fizz. is it okay. the header looks sassy and thank you for the entry!!! Whhhoooaaaa!!! You got YET another baking book on ur shelf?? lucky gal! !But well deserved, am sure you are gonna bake away like there is no tomorrow!! 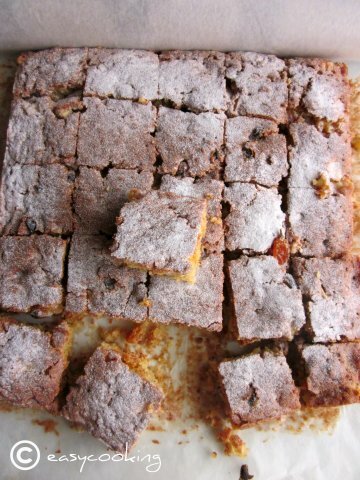 This sounds interesting,am sure I will love it if I skip the cinnamon..
the blog has a cool look- lovely looking cake ! Congrats Divya for all the gifts, here is wishing to see more of such lovely bakes on your blog. Love the square cuts of this gorgeous cake. Congrats on the wins!! Great idea there for a yummy cake! Congratulations Divya!! :) I totally love the new book that you just recieved,Marcy Goldman! She has some AMAZING recipes, actually all of them are good! 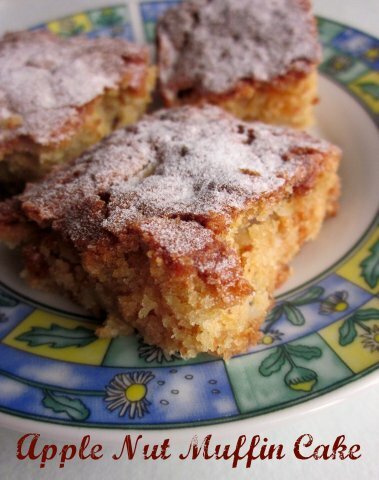 This cake would go well with a cup of tea and does not appear to complicated. The cake looks really good, nice golden brown. wow Divya, it looks super delicious. Loving the pic itself. Super Yum divya..!! I am trying out this today..would post soon..
Lovely! The combination sounds perfect to me! I want to really try this one. Have tried a few of your recipes and must say they turned out rather well!! Perfect every time..........As you have mentioned above you own The Cake Bible so would like your honest opinion about it. I am an enthusiastic baker and the end product is always goooood!! Love your recipes and the simple yet accurate instructions, thank you.